Cassandra Moseley is a research professor and senior associate vice president for research at the University of Oregon. She also directs the Ecosystem Workforce Program in the Institute for a Sustainable Environment (ISE) at the UO. She is on the graduate faculty in Political Science as well as affiliated faculty in Environmental Studies and Planning, Public Policy and Management. She is past chair of the USDA Forestry Research Advisory Council, which provides advice to the Secretary of Agriculture about forestry research priorities. She testified before Congress about rural green jobs, rural development, and the working conditions of forest workers as well as participated in dozens of briefings and presentations to congressional and presidential administration officials, including the White House Economic Council, Regional Development Cluster. She is member of the leadership team of the Rural Voices for Conservation Coalition and the Northwest Fire Science Consortium. 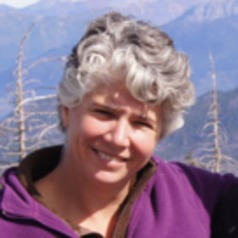 She is also a former board member of the Flintridge Foundation and the Applegate Partnership as well as recent past associate editor for policy of the Journal of Forestry. Prior to joining UO in 2001, she was an assistant professor of political science at the University of Florida. She received her M.A., M.Phil, and Ph.D. from Yale University in political science, and her B.A. in mathematics and government from Cornell University.